This is a delightful story about George, a rabbit who is rather sad when we first meet him. George watches his friends enjoying painting, skating, reading and dancing but doesn’t want to join in: he just doesn’t think he can. Wise Bear is watching and decides to do something about this. She makes George a ‘magic’ hat out of folded paper. George feels confident to have a go with his magic hat on and with a bit of practice finds he can try all the things his friends are doing and have fun too. Although he doesn’t realise it, he is doing these things with and without the hat on. When the hat disappears George is worried but Bear tells him that really the magic is inside him, not the hat at all. 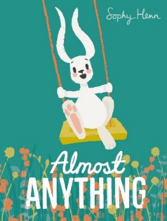 This is a simply lovely picture book about not being afraid to have a go at something new, persevering if new things are a bit difficult at first and having fun too. Before you start reading the story together look at the illustration on the cover and on the title page. The pictured character looks very different in both images, talk about this together. Read the first double page spread aloud of the story aloud, pausing to talk about all the things the animals in the forest are doing. Continue reading the rest of the story aloud, pausing if your child wants to talk about the story or illustrations. When you read the story again together encourage your child to join in, with the repeated phrases eg ‘George did nothing’ and conversations between George and his friends in the forest. Talk about what is happening on the page where George loses his hat. Talk about the magic hat – is it really magic? You could find a soft toy to wear it a rabbit, teddy or doll. Collect together some soft toys to be the characters in the story and choosing one to be Bear and one to be George, wearing a folded paper heat (see above). Use the toys and tell the story together, it is fine if children use their own words for this. Use the template here to add a picture of George to make a well done certificate for him. Is there anything your child hasn’t tried (that they could try safely?!) For example riding a bike or scooter, or joining in with a swimming lesson or eating something new.